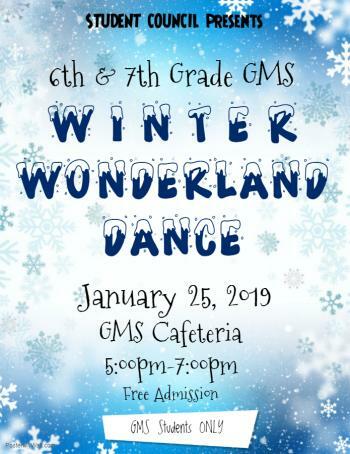 6th & 7th Grade Student Council presents our GMS Winter Wonderland Dance. The dance will be held in the cafeteria from 5:00pm-7:00pm. Admission is FREE! This is a casual dress event, no formal attire. Please make note that all school handbook policies regarding dress code will still apply. This dance is for GMS students only. Parents are welcome to chaperone. If you are interested in chaperoning, please email Mrs. Kimble or Mrs. Bilderback. We look forward to a fun filled night of dancing and refreshments!